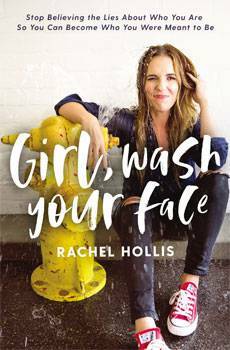 In her highly anticipated new book, Girl, Wash Your Face: Stop Believing the Lies About Who You Are So You Can Become Who You Were Meant to Be, Hollis invites readers into her world of controlled chaos, revealing 30-some years of life's battle wounds"including postpartum depression, a difﬁcult childhood, discovering her brother after he committed suicide, being a self-confessed workaholic, and suffering from stress-induced Bell's Palsy, just to name a few. But, she also encourages women to embrace the day-to-day craziness. With sometimes brutal honesty, she challenges women to want more, work harder, be transparent about the good times and the bad, and know that they are ultimately responsible for who they become and their own happiness. By sharing raw, authentic truths from her own life, she aims to have a real conversation about her experiences"the good, and the bad"and ultimately give other women permission to do the same. With chapter ending sections titled Things that helped me... Hollis walks alongside women and provides tangible tips and tricks to overcome the lies that permeate their thinking. Question: What made your write Girl, Wash Your Face? Rachel Hollis: I wrote GWYF as an answer to a question. I get the same questions over and over again from women all over the world asking me...how do I get back up when I have fallen? How do I make real change in my life? How do I get past trauma? How do you navigate mom guilt? I wanted to write this book as an answer I would give you if you were my friend. That is, You have the power to change your own life. You know the answers and you have the tools, you just need to own it. In this book I wanted to share all of my stories of when I fell down too to give you hope that you can get back up and move past all of the hurt just like I did. Question: Why do you think women constantly try to live up to unrealistic expectations? Rachel Hollis: I think that as women we are constantly comparing ourselves to other women. Women that we see on social media, on TV, or in our own communities. We are worried about what other people think of us. We try to please everyone around us except the person that truly matters...YOU! Question: How can we stop telling ourselves hurtful lies? Rachel Hollis: Someone else's opinion of you is none of your business. When we can stop worrying about what other's think and start focusing on our own worth and the power that we hold within ourselves, that's how you combat all of the lies. Question: What do you hope women take from Girl, Wash Your Face? Rachel Hollis: I hope that they find courage and strength within themselves to make long lasting change in their own lives. That they would see that they have always had the power and they just need to own it!